He was born in Ganja city on the 5th of May, 1970. After Parviz finished the 8th grade of secondary school # 1 in Ganja city, he entered the Vocational School # 15 in 1985 where he obtained a profession of a car locksmith. He was called for military service in 1988. Parviz served in Chita city for 2 years and when he was finally demobilized from the Army, he came back to Ganja in 1990. He first worked at the Carpet factory after M. D. Huseynov and later, at the Textiles Factory. Armenians were going wilder with every day. They became outrageously wild and vicious, as if wild savages unleashed from the chains. They at last showed their true disgustingly vile and foul nature which was already seen by everybody. Seeing all these bloody events and the battles for the Motherland, Parviz also decided to take up arms against the enemy. Thus, he voluntarily came to Aghdam region and was enlisted as a Commander of the Reconnaissance unit on the 22nd of February, 1992. Parviz was indeed a great soldier and a scout. He had good strategic thinking abilities and thanks to him and his team of scouts, loads of enemy equipment, strategically important posts, and manpower and ammunition storage were detected and destroyed. The bloody battles would not stop for the liberation of Gulabli village of Aghdam region on the 15th of May, 1992. The Unit where Parviz was serving was also taking part in the defense of the village. During this battle, the crew members of the helicopter “Ambulance” were saved from the paws of Armenian terrorists. But…Alas! Parviz himself was shot by an enemy sniper and killed. 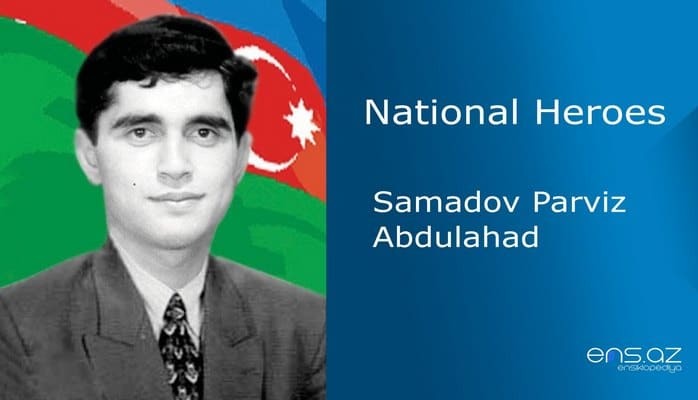 Samadov Parviz Abdulahad was posthumously awarded the title of the “National Hero of Azerbaijan” by the decree # 833 of the president of Azerbaijani republic on the 7th of June, 1992. He was buried in Ganja city. There is a street named after the hero in Ganja city.